Let us start this conversation by discussing what is a GMO. GMO stands for “genetically modified organism” and it allows intentionally selected individual genes with the desired trait (which contain DNA) to be transplanted from one organism to another. Farmers and gardeners have been creating plant hybrids for as long as they have grown plants. Genetically modifications simply serve as a more efficient and precise method for this process. Scientists do not force the transplants as some may think–either the DNA crosses or it doesn’t, just like in nature. Also, one common misconception is a GMO is a thing. Wrong. It is a breeding technology. One comment I hear over and over is GMOs are poisoning us. But when you look at the research, over 2 trillion meals have been served with absolutely no evidence of ANY ill effect from ANY GE food. I can go on and on and on with hundreds of statistics and research that prove GE foods are safe. But when you are a mom and it’s your responsibility to feed your family health and safe food, you can’t help but take notice of these claims against GMOs. Emotion takes over and statistics go by the wayside. 1) Lack of Trust. Many people don’t trust big ag companies like Monsanto. Our emotions take over when we think of corporations, whom we don’t think care about us, having a significant influence on our food supply. 2) Nostalgia. Why can’t we just go back to how we used to grow plants? Plus, we just don’t understand science and what GMOs mean for our food, or more importantly, our families. Can’t we just go back to the good ole’ days in how our food was grown? 3) Confusion. Moms are confused when they go to their local grocery store. Is this food healthy? Will this food hurt me or my family’s health? What does this label mean? Unfortunately, retail food fear marketing capitalizes on this confusion and we (consumers) are the victims. They want us to buy certain foods because we are confused and fearful. 4) Victims of propaganda food wars. There are many other countries that are banning GMOs, so they must know something we don’t, right? What about “big ag” Monsanto? I can’t defend some of the things Monsanto has done in the past, but I can defend some of the outright rumors. One common rumor is they sue farmers for trace amounts of their patented GMO seeds. Nope, nada. They have never sued a farmer for trace amounts of their patented GMO seeds. Now, if you intentionally plant seed, where an agreement was signed, saying you will not plant them, yes, may be sued. There are other myths, so I recommend checking out Myths about Monsanto to learn more. Plants should not have genes transplanted, which allows them to produce their own pesticides. The fact is, plants naturally produce their own pesticides. Why is that? For survival. We consume a significant amount of plant-produced pesticides and don’t even realize it. Genetically engineering is just unnatural. Genetically modifications do happen in nature and also through conventional methods of plant breeding. The strawberry never existed in nature as it is now and was the direct result of human crossing. In addition, it has been recently discovered the sweet potato was genetically modified. 8000 years ago. Why are other countries banning GMOs? In a nutshell, many of those decisions are political. The decision to go GMO-free has really nothing to do with the safety of GMOs, but rather other political pressures. Any many of those countries import GMO grain to feed livestock. How easy is it to bring a genetically modified seed to market? Not easy at all. It takes anywhere from 13-15 years and about $136,000,000 to bring a GMO to market. It needs to be approved by the FDA, EPA and USDA, all who test the seeds rigorously for any potential health issues. 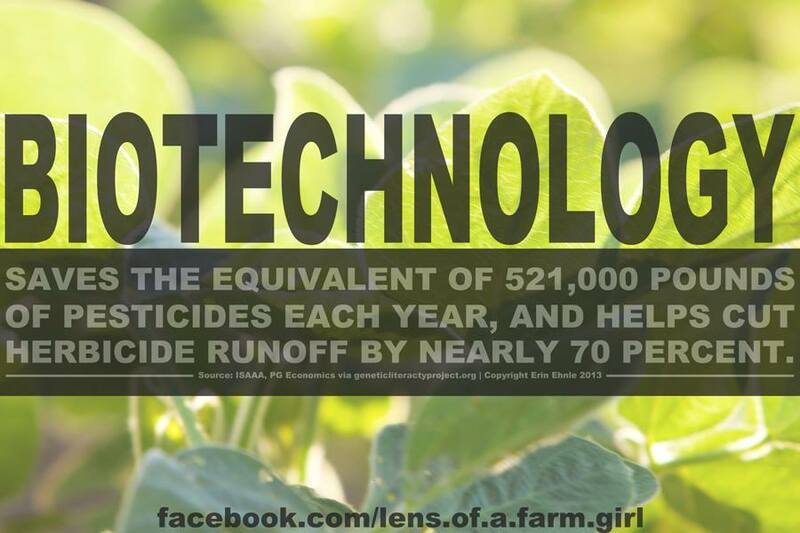 So why do we need GMOs? One reason – the GMO technology is better for the environment and is just one tool farmers can use to improve efficiencies. We use fewer pesticides on our farm and that’s good for the environment. There is less runoff (70% less), less water is needed, less soil erosion (90% less), less plant disease and less pesticide exposure to my husband. But it’s just not benefiting farmers, consumers can benefit as well. Genetically engineering can mean higher levels of omega 3 fatty acids (save the salmon), higher vitamin content, better food shelf life, fewer allergens (think of peanuts with no allergens) and many more benefits. But in order for these improvements to happen, we can’t be afraid to use technology. And there are many more waiting on “the shelf” just waiting for consumer approval. How many foods are genetically modified? There are only 10 foods that have been approved for genetically engineered – corn (both field and sweet), soybeans, cotton, canola, alfalfa, sugar beets, papaya, apple, potatoes, and squash. That’s it. So what are moms supposed to do? It may seem like “GMO-free” label indicates the food is better than those without the label, but that isn’t exactly right. Nutritionally, GMO and non-GMO foods are identical. Moms need to be smart consumers and not fall for “food fear” marketing tactics. I know–it’s hard. And all too often, consumers end up paying more for the “GMO-free”. Remember the “follow the money” adage? That’s exactly what this is about. It’s about the money. In regards to the General Mills Cheerios decision-the old and new Cheerios are the same. Oats are the main ingredient in Cheerios and oats are not Genetically Engineered. 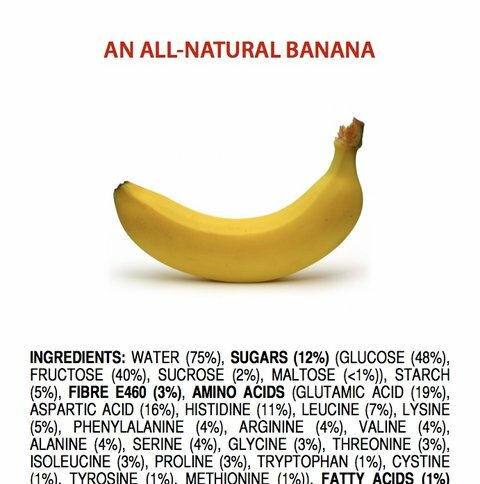 The little bit of sugar used for taste is highly processed, which means it contains no DNA, therefore cannot be genetically engineered. Do you see where this is going? Let’s be smart, moms. Let’s do our research and not fall into “food fear” marketing campaigns. These companies know exactly what they are doing and it means big dollars ($) for these companies. And if this isn’t enough, we have the backing of reputable science authorities including the U.S. National Academics of Science, the British Royal Society, the American Association for the Advancement of Science,the American Medical Association and the World Health Organization (and many more organizations) support the conclusion that genetically modified foods are safe. So are you going to believe these reputable organizations or what someone, who most likely has no science background, has written on the Internet? As a mom and grandma, I am not afraid of GMOs. Look at who is on our side. Science has won out and is on our side. Our intelligence is on our side. We as consumers need to stand up and be aware of our emotions and “food fear” marketing and not let it take over our common sense and our reasonableness. And this is why it’s okay to feed your family GMO’s.